Among the many Marvel Comics characters yet to be introduced in the Marvel Cinematic Universe, Nova is chief among them. The cosmic character, whose real identities include Richard Rider, Sam Alexander (son of another Nova), among others, is somewhere near the front of the line for a standalone Marvel big screen opportunity. Speaking to ComicBook.com at a press event for Avengers: Infinity War, Marvel Studios president Kevin Feige addressed the possibilities of the human rocket barreling towards theaters. 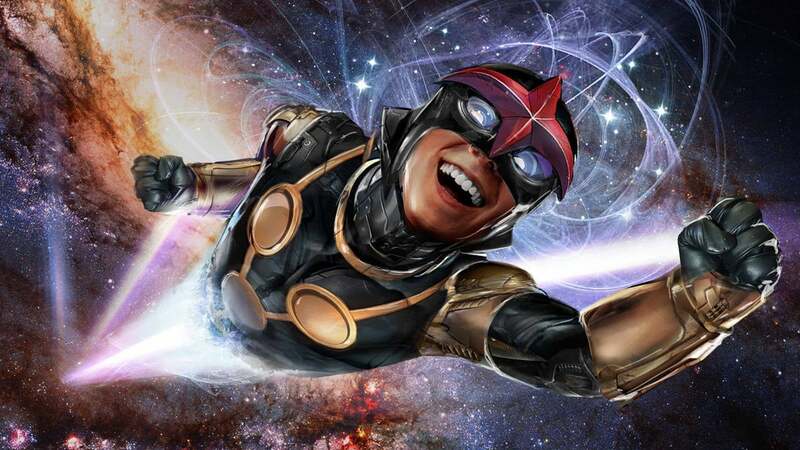 "Nova is… if we have a big board with a bunch of characters that have more immediate potential, Nova is on that board," Feige said in the exclusive interview. "Because of the connection to the Guardians universe, because there are more than one examples to pull from in the comics that are interesting. And you’re absolutely right, he was in the earliest drafts of the [Guardians of the Galaxy]." However, Feige wouldn't go any further with a timeline for the character potentially arriving in live-action. With Guardians of the Galaxy Vol. 3 on the way following the third and fourth Avengers movies, it is possible for Nova to appear in the Marvel Cinematic Universe before getting a standalone film. Feige did offer a slight tease to the future of the Marvel Cinematic Universe and how it's titles and character pairings might look. "It'll vary movie by movie," Feige said when asked if another Infinity War-type ensemble will come along. "You can't do that every two years. You'd be fooling yourself. I love that our most recent movie was almost as self-contained as anything we've ever done in Black Panther and it was successful beyond our wildest dreams. It all just depends on the story." As far as characters like Nova or any other Marvel Cinematic Universe-newcomers are concerned when it comes to movies versus small screen, Feige says those choices also depend on several factors. "It varies," Feige said. "It's the internal group of us at Marvel Studios and then, of course, conversations with Alan Horn, the chairman of the studio, and it varies. It varies in terms of characters who audiences like and want to see more of, which is how you get to Ragnarok, or characters that we know are great and have wonderful supporting characters and literal worlds that we can tap into like Panther and Wakanda. So, it always varies. Now, we're at a point where there are a lot of both." For now, it's all about getting through Avengers: Infinity War before deciding what the next move is. "We're figuring those things out," Feige said. "It is a very unique embarrassment of riches right now because there are so many of the characters that audiences are clamoring to see more. The question is how do we show them all?" Avengers: Infinity War hits theaters on April 27, 2018. Have questions about ComicBook.com's time on set or at the press events? Leave them in the comment section or send them to @BrandonDavisBD on Twitter!